Your browser does not support the video tag. Ingredients Cookie: 2 ½ cups (375 mL) all-purpose flour 1 tsp (5 mL) baking powder 1/4 tsp (1 mL) salt 3/4 cup (175 mL) Lactantia® European Style Butter, Unsalted, room temperature 1/2 cup (125 mL) sugar 1 tbsp (15 mL) brown sugar 1 egg 1 egg yolk 1 tsp (5 mL) vanilla extract Butter Tart Filling: 1 cup (250 mL) packed brown sugar 1/2 cup (125 mL) Lactantia® European Style Butter, Unsalted, room temperature 1 tsp (5 mL) all-purpose flour 1/4 tsp (1 mL) salt 1 tbsp (15 mL) corn syrup 1 tsp (5 mL) vanilla extract 1/2 cup (125 mL) chopped pecans Instructions Cookie: Whisk together flour, baking powder and salt; set aside. In another bowl, beat together Lactantia® European Style Butter, sugar and brown sugar using hand mixer until light and fluffy; beat in egg and egg yolk until incorporated. Beat in vanilla. Add flour mixture and beat on low speed just until mixed. Divide dough into 2 portions, flatten each into a disk and wrap in plastic wrap. Refrigerate for at least 1 hour or overnight. Butter Tart Filling: Beat together brown sugar and Lactantia® European Style Butter with hand mixer until light and fluffy. Sprinkle with flour and salt; beat until combined. Stir in corn syrup and vanilla. Fold in pecans; set aside. Preheat oven to 350°F (180°C). On lightly floured work surface, roll one portion of dough to 1/4-inch (5 mm) thickness. Using a floured 3-inch (8 cm) round cookie cutter, cut out rounds, re-rolling scraps to make 12 cookies. Using 2-inch cookie cutter, cut out the centres of 6 of the cookies. Stack the donut shaped cookies on top of other 6 cookies, lining up edges. Roll second portion of dough, cut and stack in same manner to make 6 more stacked cookies. Transfer to two parchment paper-lined baking sheets, spacing at least 2-inches (5 cm) apart. Chill for an hour. Spoon heaping 1 tsp (5 mL) filling into centre of each cookie. Bake, one baking sheet at a time, for 10 to 12 minutes, rotating pans halfway through, or until cookies lightly golden around edges and filling is bubbling. Transfer to wire rack and cool completely. Tips Substitute walnuts, raisins or chocolate chips for the pecans. Cookie: Whisk together flour, baking powder and salt; set aside. In another bowl, beat together Lactantia® European Style Butter, sugar and brown sugar using hand mixer until light and fluffy; beat in egg and egg yolk until incorporated. Beat in vanilla. Add flour mixture and beat on low speed just until mixed. Divide dough into 2 portions, flatten each into a disk and wrap in plastic wrap. Refrigerate for at least 1 hour or overnight. 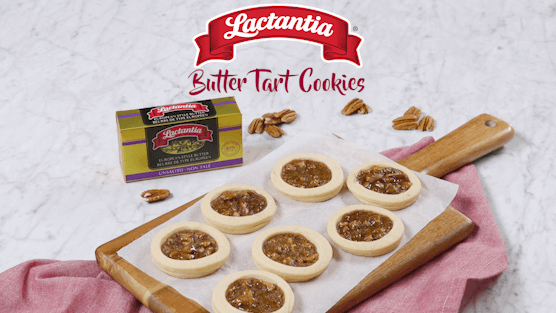 Butter Tart Filling: Beat together brown sugar and Lactantia® European Style Butter with hand mixer until light and fluffy. Sprinkle with flour and salt; beat until combined. Stir in corn syrup and vanilla. Fold in pecans; set aside. Preheat oven to 350°F (180°C). On lightly floured work surface, roll one portion of dough to 1/4-inch (5 mm) thickness. Using a floured 3-inch (8 cm) round cookie cutter, cut out rounds, re-rolling scraps to make 12 cookies. Using 2-inch cookie cutter, cut out the centres of 6 of the cookies. Stack the donut shaped cookies on top of other 6 cookies, lining up edges. Roll second portion of dough, cut and stack in same manner to make 6 more stacked cookies. Transfer to two parchment paper-lined baking sheets, spacing at least 2-inches (5 cm) apart. Chill for an hour. Spoon heaping 1 tsp (5 mL) filling into centre of each cookie. Bake, one baking sheet at a time, for 10 to 12 minutes, rotating pans halfway through, or until cookies lightly golden around edges and filling is bubbling. Transfer to wire rack and cool completely. Substitute walnuts, raisins or chocolate chips for the pecans.